Custom sizing available. Please contact us with any requests. * Plus $75 Delivery Fee. Please read our Ordering page for full details relating to ordering, delivery, timeline and payment. 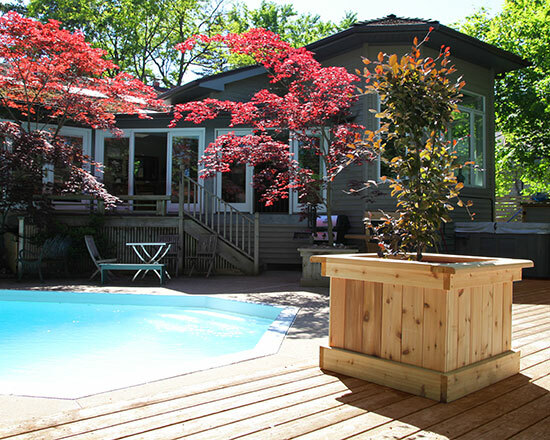 Our planters can be put on decks, paving stones or on grass. 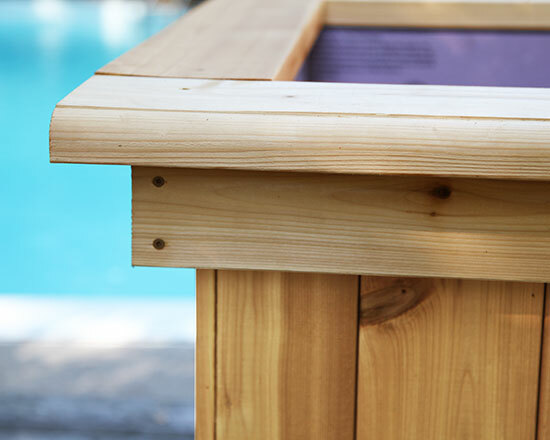 While our planter is mainly built from cedar, the floor is made from pressure-treated lumber to resist rot. We suggest you put a layer of gravel on top of the flooring to further separate the soil from the floor. The inside walls of the planter are separated from the soil using foam insulation (see further down). 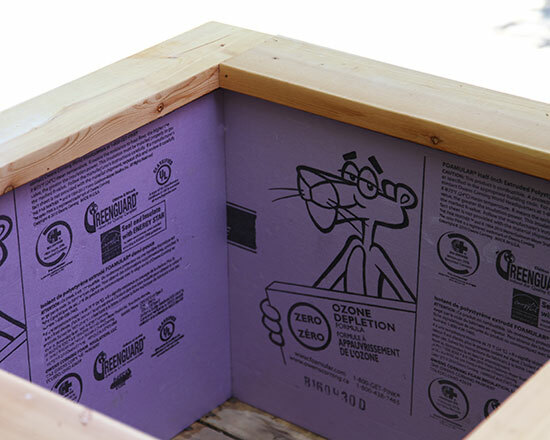 The insulation not only keeps the cedar planter walls from rotting - it also provides protection from the winter freeze/thaw cycles that damage the small roots of potted trees or plants. This customer in the Kingsway neighbourhood of Toronto has told us that the planter makes for a handy surface for putting drinks. 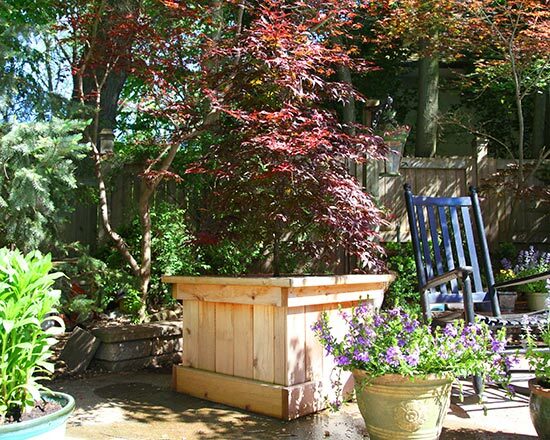 Although the planter pictured here is our standard size, we can build to most requested dimensions. Contact us for a quote. 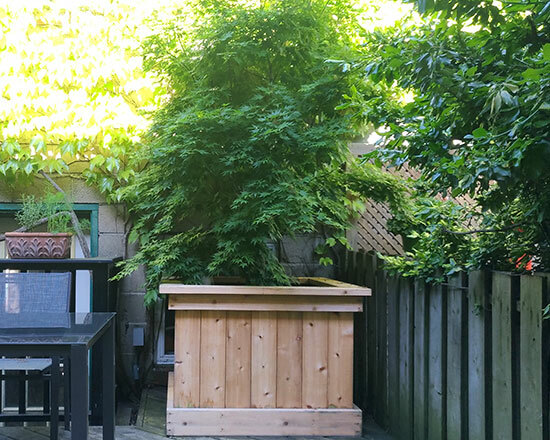 This planter fills the corner of a small (16x12 foot) backyard in the High Park neighbourhood of Toronto. The tree provides shade while blocking some of the concrete block garage behind it from view. 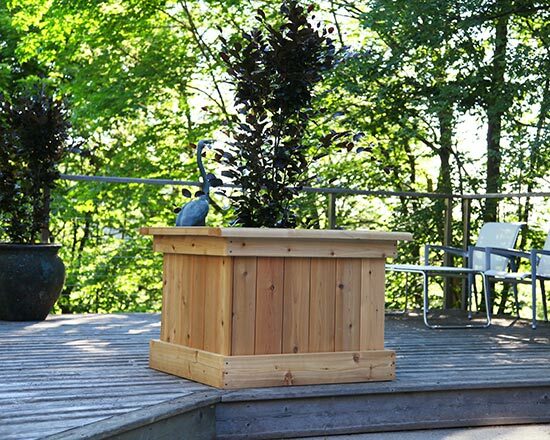 Our planter is built from high-grade cedar. We shape the top edges with a router to give some interesting detail to the wood. The inside walls of the planter are separated from the soil using foam insulation. The insulation not only keeps the cedar from rotting - it also provides protection from the winter freeze/thaw cycles that damage the small roots of potted trees or plants.